This was one of those mornings with more atmosphere than I could dream for. The conditions kept changing dramatically every few minutes, so I picked out what I could of the sky, ground and water, and challenged myself to try to make a cohesive whole out of all those bits! The highest peak in the painting is Kaaterskill High Peak, and to the right is Round Top. 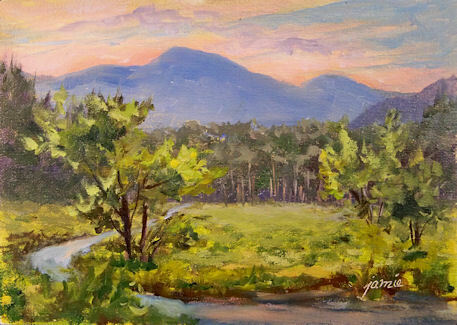 These two peaks dominate the landscape of Kaaterskill Clove, home to the Hudson River School painters…and me! $720.00 plus $30 shipping and insurance within the Continental United States. For local sales, shipping charge will be allocated to NYS Sales Tax. Please email me at JamieWG@aol.com for International purchases or with any questions. I love this view of the barns against the eastern escarpment of the Catskill Mountains. 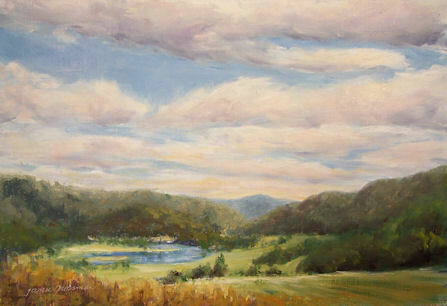 This was painted on location, on this warm, breezy day of changing clouds and moving light. I loved the contrast in color temperature between the orangy fields and blue-green mountains, with the red spots of color contributing a nice focal point. I didn’t quite have time to finish this today, but should be able to wrap it up tomorrow. 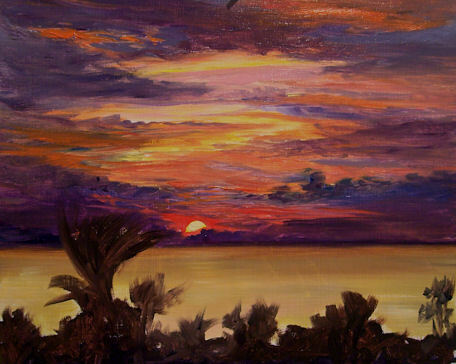 This was painted from a photo taken along Florida’s Gulf Shore by my daughter, Sarah. It’s one of those paintings that I thought wouldn’t take nearly as long as it’s taking, but it will be worth the struggle in the end! With a little luck, the completed painting will be posted tomorrow. Stay tuned! I love these 1:2 ratio compositions, but it can be difficult to find one that works vertically for a landscape. This one gave me the perfect opportunity, with the house set up so high on the hillside, and the cows down below. My palette for this painting was the same as yesterday’s, with the addition of Williamsburgh Cadmium Yellow Light and some RGH Transparent Yellow Oxide. There’s a little bridge that goes over the east end of Titicus Reservoir in North Salem, New York. It’s quite narrow, with a fair amount of traffic, and definitely not a good spot to try to set up an easel! The western view at sunset from that location is beautiful, so from time to time I make a quick stop to take photo references when it looks like the sunset will be especially inviting. 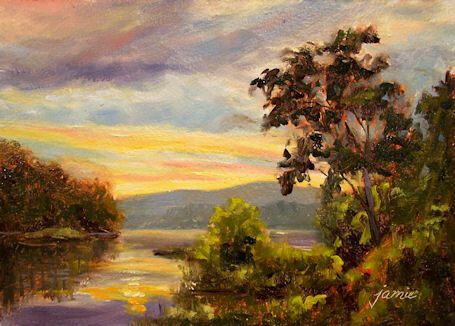 This was painted from a photo taken on one of those evenings. 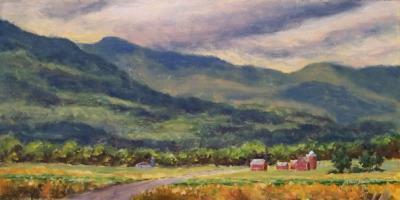 This is the finished painting that I started on location a couple of days ago. This time of year unfinished paintings often sit around my studio for a long time while I’m busy outside painting plein air pieces. I’m glad I had some studio time to get this one done — a blessing in disguise! 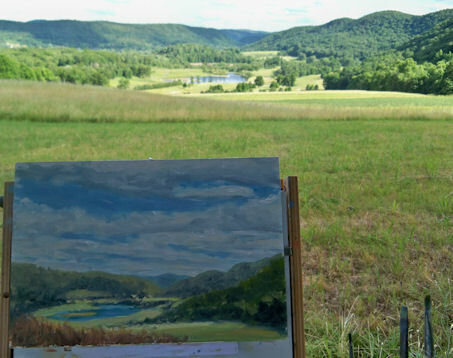 I finally got out to paint yesterday, traveling up to the rolling hills of Amenia, New York to explore with my friend Tarryl. In the afternoon, we stopped briefly at this overview to paint for awhile. I wasn’t able to finish on location, but got a nice start to wrap up in the studio. I was really sick for a couple of weeks and then my dad was in town for a week. We had a great time together traveling all over the Hudson Valley. Now I need to get back to the brushes. I’m so rusty! It’s time to shake off the rust and enjoy my painting life again!